During its existence, Canaba has built over a thousand prefabricated, customized houses. As well as receiving many prestigious awards, the firm has become one of the market’s most significant players. 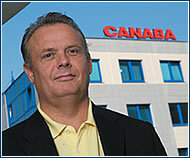 THE CURRENT success of the Canaba development company was in fact spurred on by the collapse of Presta, a pre-cast concrete company in Česká Lípa. 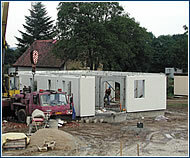 Civil engineer Jaroslav Kalenda, an expert in land development for many years, had tried to save the production program of the stagnated Presta by pushing the company towards manufacturing prefabricated, customized houses (so-called “concrete sandwiches”) with the help of modern Swedish technology. But when Presta declared bankruptcy in 1991, Kalenda decided to establish a development company along with several partners, and began doing business on his own. The initial stages were not easy – for almost six years the firm was unable to overcome the Czech aversion to concrete panels as construction material, as they are a symbol of “panelák” housing projects such as Jižní město in Prague. First, Canaba focused its attention on Germany, where customers understood that the quality of the new panels was different than during the period of socialism. During those several years in Germany, the firm participated in the realization of over 300 buildings, yet because of fierce competition and the strengthening crown, it was forced to withdraw from the market. Kalenda and other shareholders had a clear and courageous vision – to succeed in the Czech Republic building customized houses. But there were two snags: first, they had no capital, and second, they had no experience with business of this kind. “I see the basis of our success in the fact that we jumped right into it even though we didn’t understand much,” insists Kalenda, chairman of the company’s board of directors. “Those who understood it were apprehensive, so the market was open to us, though in the beginning we had zero capital. We just bet on the fact that everybody desires their own house and garden so that they can make decisions about their property themselves,” he explains. Canaba– a Latin expression for a group of houses, built either near the Roman legion encampments or in the suburbs of ancient Roman towns, settled by artisans and merchants, and that later evolved into towns. This hypothesis has since been proven. The demand for individual housing was so strong that clients fully paid for the entire development in advance, enabling Canaba and similar development firms to do business without loans. This method of financing, which is completely non-existent in the west, was common in the Czech Republic in the nineties – until 1997, when development company H-Systém declared bankruptcy and over a thousand affected clients lost a total of CZK 1.3 billion, tunneled by the former managers of the firm. Kalenda acknowledges that the H-Systém case shook public trust in the seriousness of advanced financing, and notes that although their own approach was based on honesty, Canaba no longer uses this method. 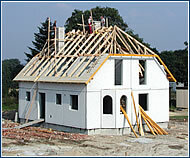 Economical livingThe entire structure is built from large, modern components, so construction is quick and inexpensive. The well thought-out structure of sandwich walls ensures excellent thermal insulation and accumulation, which means savings in heating Canaba houses that is far from negligible. The basic houses have a washed-out facade made from crushed lime, which does not require any maintenance or repair. The production is ecological and in accordance with strict European standards. 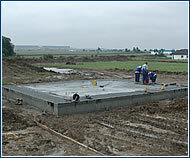 Canaba uses the modern technique of prefabricated parts, improving it continuously. Since construction is carried out by well-trained specialists, the risk of error is minimal. This type of quality control is evidenced by the minimal amount of client complaints. In addition, house made-to-order can be built within a couple months. Potential customers are also often attracted by the price, which, for the simplest house, compares to the price of an average-size Prague apartment. However, this type of development also has its disadvantages, which are especially emphasized by architects – the houses are more or less uniform and the variability of the design is limited to a large degree. But it seems the general public is more pragmatic than architects. Most visitors to the model houses are surprised by the practical character of the internal layout, which evokes a feeling of spaciousness even in a relatively small house. Readers of Můj dům magazine chose the Classic type as “House of 1995” and the Variable type as “House of 97/98”. The firm, which was originally headquartered in Děčín, moved its offices to Prague in 1999. It now has representative offices in eight Czech towns and, since 2000, in Slovakia as well. The number of employees has stabilized at 418. In 2001, sales of the Canaba group reached CZK 476 million, and profit for the last five years has hovered around 0.5-1% of the annual turnover. The firm has property worth several hundred million crowns, consisting of a factory, a fleet of machinery, its own headquarters and the model houses. 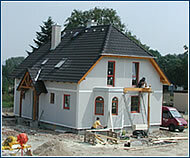 It has practically no competition in this country in the area of solid, prefabricated houses.